View More In Nativity - Page 3. 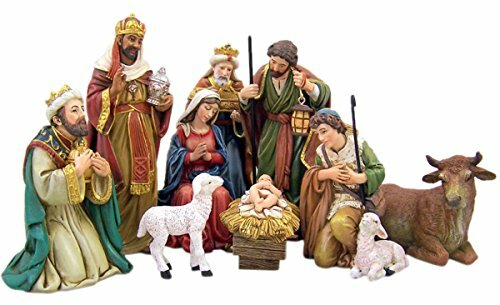 This line of Nativity sets from Avalon Gallery are designed by acclaimed artist Michael Adams and feature the attention to movement, posture and emotion that is a hallmark of his work. Each set depicts the birth of the Christ Child and those who came to honor him and are exquisite in every detail. The sculpting, painting and fine craftsmanship of each piece beautifully demonstrates the high quality standard for which the Avalon Gallery brand is well known. If you have any questions about this product by Michael Adams Exclusive, contact us by completing and submitting the form below. If you are looking for a specif part number, please include it with your message. Deluxe Olive Wood Nativity Set- Hand Carved in Bethlehem, the Holy Land.